Portland, OR – BibRave, an innovative marketing solution for races and endurance brands, has extended its partnership with AfterShokz, the the award-winning headphone brand known for its open ear bone conduction technology. 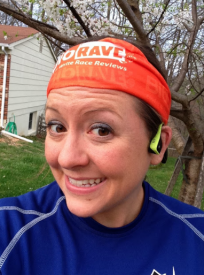 BibRave’s brand marketing program, which involves seeding product to a large group of vetted running ambassadors (BibRave Pros) who create blog reviews and social media promotion around the product, allowed AfterShokz to reap all the benefits of a large and actively managed ambassador program without all the headaches. After seeing what BibRave’s program produced, they signed on for two additional brand campaigns. As lead sponsor of United Relay of America, the first ever triple coast-to-coast charity relay, AfterShokz also saw an opportunity to leverage BibRave’s race promotion services. BibRave coordinated 12 BibRave Pros in 9 states to publicize the event and run 21 segments along the Red, White, and Blue routes across the country. The BibRave Pros’ creative content drove awareness and additional sign-ups for the massive, cross-country charity event. Along with blog and social promotion from the BibRave Pros, AfterShokz also sponsored BibRave’s popular Twitter chat – #BibChat – a weekly conversation about all things running and racing. The #BibChat sponsorship placed AfterShokz at the front of a lively and active conversation where runners come to learn about new running related products. AfterShokz brings patented bone conduction technology, initially developed for military special operations and law enforcement by Voxtech in 2001, to sport, mobile and Bluetooth® headphones designed and priced for everyday use. Through a suite of proprietary audio technologies and the only completely open ear design, AfterShokz headphones deliver premium stereo sound and a promise of safety and comfort that is second to none. Since its inception in 2011, the company has been committed to innovating unconventionally and making situational awareness a priority. Learn more about how to #BeOpen at aftershokz.com. BibRave works with races and brands to help them engage with runners and ultimately drive more sales and registrations. Through their large network of running bloggers, BibRave Pros, and their popular Twitter event, #BibChat, BibRave helps endurance brands and races go beyond simple advertising and truly connect with more runners. The company’s consumer facing-product is a race review site where runners can learn about a race before signing up, and leave feedback after the event. The company launched in late 2013 in the Midwest and is now based in Portland, Oregon.